Its been 5 years since Iles has published a book (and yes, I’ve read them all.) When I got my advanced copy, it was almost 800 pages. 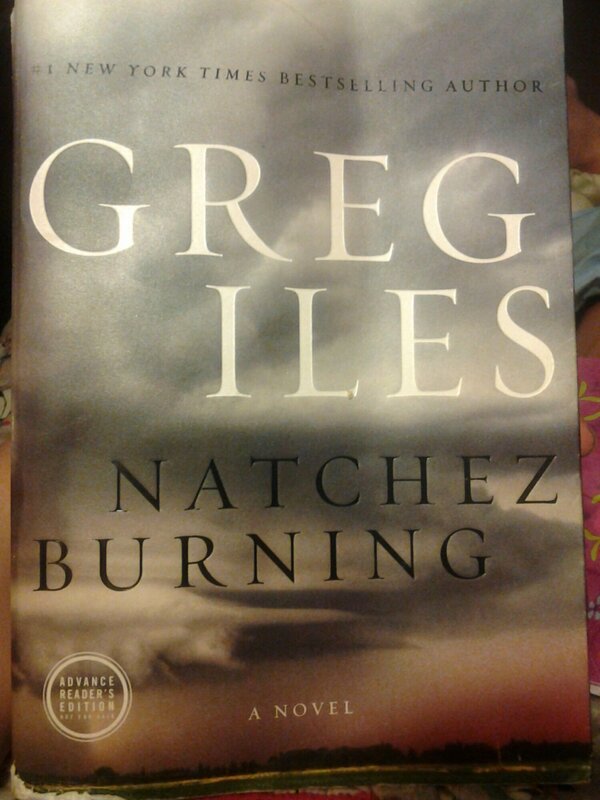 All I could think was, “Greg Iles, this better be worth it.” Well, I am here to assure you Natchez Burning was completely worth it! In Natchez Burning, Iles returns to Natchez, Mississippi and the character of Penn Cage, defense lawyer turned mayor- familiar ground to fans of Iles’ work. Cage has only recently gotten Shadrach Johnson off his back (thanks to an incriminating photo) and is focused on his wedding to his long-time girlfriend, Pulitzer-prize winning journalist Caitlin Masters. Cage’s world is shattered when Johnson tells him that Tom Cage, Penn’s well-respected physician father, is going to be charged with murder after helping a dying patient, Viola, end her life. Tom Cage has recently suffered a heart attack, and Penn wants to protect his family at all costs. Will he be able to exonerate his father, solve the mystery of Viola’s death, and keep his girlfriend, daughter, and mother safe? Local journalist Henry Sexton is closing in on the Double Eagles, a radical Klan offshot responsible for many race crimes, and rumored to be involved in the murders of Dr King and the Kennedy brothers. He has finally gotten an old, dying Double Eagle to go on the record- solving many old crimes, including one that is personal to Henry. Will he be able to publish the truth? Will it be worth it for him? All of Penn Cage’s best laid plans are ruined when his father skips bail. Henry Sexton is attacked outside his office. The stories of Tom Cage, Viola, and the Double Eagles are deeply tangled together in history. Caitlin Masters is torn between publishing the truth and keeping her loved ones safe. Note: joking aside, Greg Iles was involved in a very serious accident that delayed the publication of this book. The health of an author and their family is much more important then my entertainment. I wish him all the best.